A quick look at the "Required" list above will show you that The Seafarers of Catan: 5-6 Player Expansion is not an entry-level game to the universe of Catan. It's for the gamer who already has a substantial investment. If you want to take your Settlers and Seafarers play to a larger group of people, this box is a must. If you want to expand the variety of scenarios you can play, which a greater number of maps and challenges, this box is a must. It'll extend and expand the gameplay of The Seafarers of Catan. At this level of Catan play, we're not going to condescend to you. You're an experienced gamer and experienced Catan citizen. 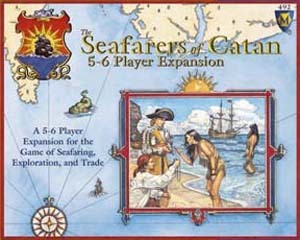 The Seafarers of Catan: 5-6 Player Expansion is for you if you want more of the same.